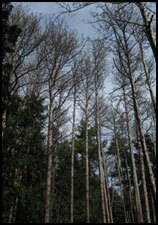 Red pine scale was detected in Maine forests in September 2014 in Mount Desert (Hancock County). It was first detected in North America in 1946 in Easton, Connecticut. Please report suspected scale. Off-color needles progressing from olive-green through red; first seen on individual branches, then throughout the tree. Red pine scale is known to infest red pine (Pinus resinosa), Japanese red pine (P. densiflora), Japanese black pine (P. thunbergii) and Chinese pine (P tabulaeformis). It is not thought to survive on jack (P. banksiana), pitch (P. rigida), Scotch (P. sylvestris), eastern white (P. strobus), Austrian (P. nigra) and mugo (P. mugo) pines. There are two generations a year. Eggs are laid in May, with first-instar larvae appearing by June. The larvae settle down and feed, usually under a bark scale. They transform to an intermediate stage by mid-July. Pre-adult males emerge in August, and spin a loosely-woven cocoon in which they transform to winged true adults. Adult females emerge from the intermediate stage, mate and lay eggs from August into September. The crawlers that hatch from this overwintering generation settle down and become dormant, they transform to intermediate stage beginning in April, and rapidly develop through adults. Adult females are brick-red, wingless, soft-bodied insects with well-developed legs and antennae. They are approximately 1/16th”-3/16th” long, pear shaped and coarsely wrinkled. Adult males are smaller (1/32nd”-1/16th”), two-winged, midge-like insects. Females deposit small, yellow eggs in a white, woolly ovisac. First-instar larvae resemble females, but are much smaller (~0.01”). Intermediate stage larvae are elliptical in shape, and lack legs and antennae. They resemble smooth, waxy pods, and have sparse tufts of white wool. Sub-adult males spin white, capsule-shaped, loosely woven cocoons. These are often visible on affected branches. Some control can be attained on ornamentals by two applications of horticultural oil at two percent rate (applications in early June and early September). Avoid fertilization. Winter harvests of infested trees will reduce incidence of spread. *NOTE: These recommendations are not a substitute for pesticide labeling. Read the label before applying any pesticide. Pesticide recommendations are contingent on continued EPA and Maine Board of Pesticides Control registration and are subject to change. For your own protection and that of the environment, apply the pesticide only in strict accordance with label directions and precautions. Bean, J.L. and P. A. Godwin. 1971. Red Pine Scale. Forest Pest Leaflet 10. USDA Forest Service. Weimer, J. 2012. Red Pine Scale, Matsucoccus resinosae. Pest Alert. NH DRED, DFL.